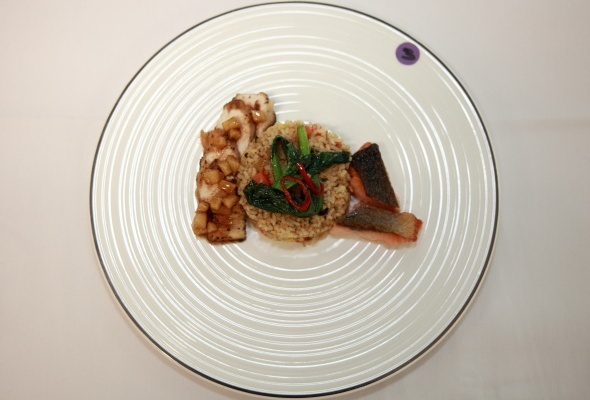 If you're not sure what to do with your unconsumed or excess food at home, try these recipes developed by culinary students for our inaugural Save Food Cut Waste Recipes Competition 2016! We welcome you to contribute your leftovers recipes. Simply drop us an email with your name, recipe name, a picture of the dish, ingredients, and cooking method. Looking forward to your yummy recipes, thanks! If you have excess white bread, oranges and apples at home, use this recipe to turn them into a delicious crepe dish! 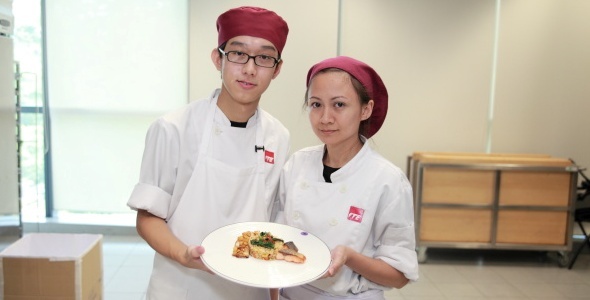 This recipe is developed by Pamela Low and Marcus Tan, Pastry and Baking students from ITE College West. Lemon Zest – 1 no. Orange Zest – 1 no. Excess Orange – 2 nos. Orange Zest – 1/2 no. Excess White Bread – 2 nos. Whisk all the ingredients together except the lemon and orange zest. Sift the mixture and add in the orange and lemon zest. Abstract the zest from both orange and lemon. Use the zest and mix with the room temperature butter. Set aside. Abstract the juice from the orange and lemon. Bring juices to a boil with the sugar and butter previously set aside. Flambé the sauce with Grand Marnier. Whisk all the ingredients (except corn oil, orange zest and orange compound) under medium high speed for 8 minutes. Fold in the corn oil, orange zest and orange compound lightly and evenly. Bring to bake at 180 degree Celsius for 30 minutes or till golden brown. Boil the sugar and water till caramel stage. Chill it till the desired consistency to make spun sugar on the wooden spoon using fork. Bring the milk, sugar, vanilla essence to boil. Mix the yolk, corn flour, custard powder well. Pour the hot liquid over to the yolk paste and temper it. Bring it back to heat and cook till thicken. Allow to cool and add in butter. Chill pastry cream in chiller. Fold in whipped cream into chilled pastry cream. Brush the bread with melted butter and sprinkle with sugar. Bring to bake at 180 degree Celsius till golden brown. Bring all the ingredients to boil except yolk and sugar (2). Temper the yolk and sugar (2) with the boiling mixture. Bring back to heat and cook till desired thickness. Chill and bring to churn in the ice cream machine. All cooked food should be refrigerated or frozen within 2 hours after cooking. Store cooked food in a clean, shallow container. Use shallow containers and leave sufficient air space around the food to promote rapid and even cooling. Cooked food stored in large, deep containers remain warm for a longer time. Dangerous bacteria may grow in this warm spot which can lead to food poisoning if consumed. When freezing cooked food, make sure they are wrapped tightly. Keep your refrigerator uncluttered so that air can circulate and cool food properly. Do not refreeze frozen food that have been thawed. As a general rule, do not keep cooked food for more than 4 days. We assume no responsibility or liability for any damages or losses you may experience as a result of following the recipes, instruction or advice on this website. Zero Waste SG and ITE have the rights to use the recipes and photos for our websites, publications, activities, and for other purposes. If you have unconsumed cooked rice, vegetables and chicken meat, or excess carrots, tomatoes and apples at home, use this recipe to turn them into a delicious dish! 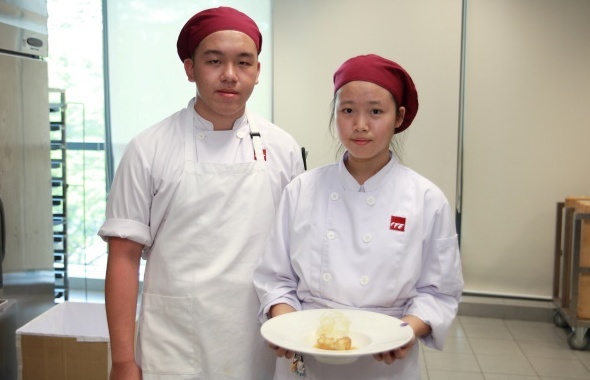 This recipe is developed by Wong Kah Jun and Sulastri, Pastry and Baking students from ITE College West. Excess Apple – 1 no. Yellow Onion – 1 no. Stir fry the cubed carrots and chopped onions till lightly brown and remove from pan. Melt a tbsp butter in a pan, add in cooked white rice and fried till golden in colour seasoned with a little salt and pepper. Add in the cooked carrots, chill, onions and spring onions into the cooked rice and fry till fragrant. Peel and cube the apple. In a pan melt butter and cook the apple cubes till soft before adding cinnamon sugar. 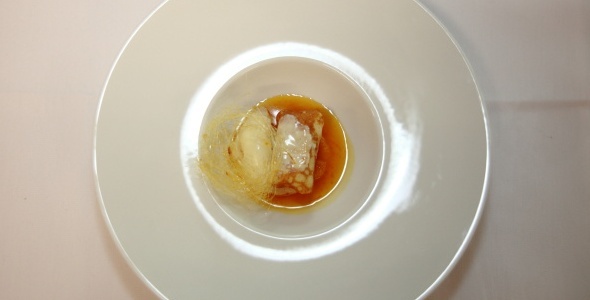 Cook till sugar caramelise. Remove and let it cool. Season chicken breast meat with a little salt and pepper. In a pan lightly sear the chicken, cook till golden in colour. Add some oil into pan and add in the salmon, skin side down and cook till the skin is crispy. Boil some water seasoned with salt and blanch the vegetables and soak it ice water to prevent further cooking. Lastly plate all the ingredients. If you have unconsumed cooked rice and chicken meat, or excess tomatoes at home, use this recipe to turn them into a delicious dish! 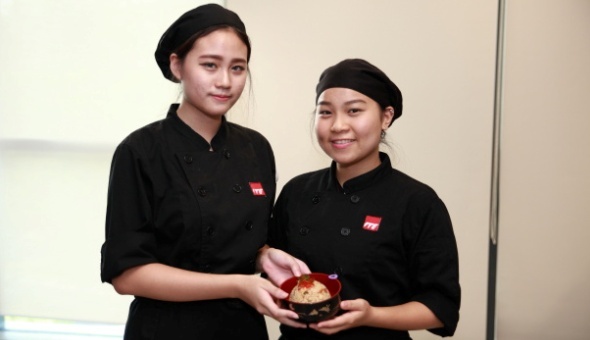 This recipe is developed by Lee Zhi Wei Jolyn and Chloe Chiam Ke Xuan, Asian Culinary Arts students from ITE College West. 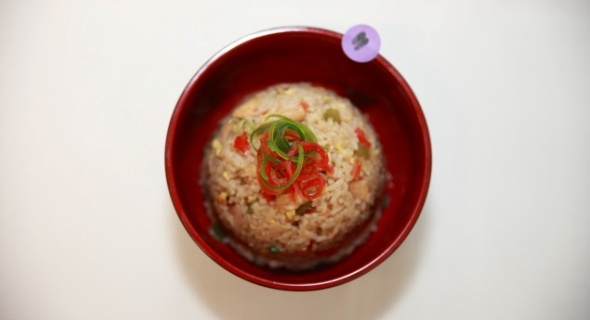 Take out the unconsumed rice. Cut the cooked chicken into small pieces and season with salt and black pepper, if necessary and set it aside. Chop and cut the red, green capsicum, onions, tomatoes, garlic and shallots into cubes size, then set it aside. Slice the parsley and spring onion into small pieces and soak it in ice water. Heat up the wok with some oil. Stir fry the chicken and set it aside. Stir fry the garlic, red and green capsicums, onions and shallots. Add in the chicken and cooked rice. Add the light soya sauce, oyster sauce, white pepper, salt for flavour, dark soya sauce for appearance. Stir fry for a while using medium heat. Lastly, garnish it with sliced spring onion and parsley.